The Club Hotel Riu Paraiso Lanzarote Resort is an all-inclusive 4 star property located by the large Playa de los Pocillos beach and a convenient 10-15 minute transfer by taxi from Arrecife airport. The white-washed two storey building borders the garden and sun terraces around the swimming pools. A good choice for couples and families, here you will enjoy a quality hotel with plenty of amenities. The hotel has a quiet location during the day but with the option to sample the lively nightlife in nearby Puerto del Carmen. The hotel has 501 rooms in the main hotel with bathroom and hairdryer, telephone, central air conditioning, telephone, mini-fridge, satellite TV, in-room safe and balcony or terrace. In addition there are 97 family rooms in 2 annexes located in the grounds of the hotel these are equipped with bathroom and hairdryer, telephone, central or individual air conditioning, ceiling fan, fridge, satellite TV, in-room safe, 1 or 2 bedrooms, living room with sofa bed, balcony or terrace. The Club Hotel Riu Paraiso offers a full day time entertainment program for adults 6 days per week, for sports enthusiasts there are two tennis courts available at the hotel, you can enjoy the pool table, table tennis and volleyball. Nearby there are opportunities for horse-riding, bike hire and an 18-hole golf course. Breakfast and dinner are served buffet style in the hotel's main restaurant, with light lunchtime snacks and of course a cool drink available from the swim-up poolside bar. Theme restaurants providing Asian and Canarian cuisine are popular here so is the lounge bar and nightclub where the Riu Paraiso has an evening entertainment programme with live music several times a week to entertain its guests. 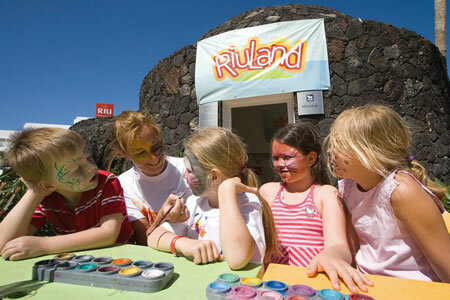 The hotel has a great range of facilities including four swimming pools (2 heated in winter) 2 children's pools (heated in winter) kids also have a playground and the 'Riuland' kids club. If you would like to pamper yourself the hotel has a health and beauty centre here you can enjoy physiotherapy, massages, beauty salon, professional Wellness treatments and more. There is a complimentary gym and bio-sauna, a hairdresser, hobby club, internet corner, boutique and gift shop.